We all know that it is hard to study and it does not matter where you are studying. Moreover, some specialties are enough complicated. They require more praxis, more assignments, more exams, etc. The worst times begin when you are on the verge of graduating. Final semester of the final year is the hardest due to its pressure. Every next day becomes harder and harder, you cannot do anything at all. You are completely exhausted and drained. Does it sound familiar? So, how to hold out? Plan your days. It will save your head from the mess of tasks that you should do in the nearest future. You can buy or make by yourself the erase board, which will really ease your life! Use colorful pens for writing tasks, assignments, meetings, and dates of exams everything you do not want to forget. I hope that you have your own methods of organization that are useful for you. So, plan your actions properly and be very attentive! So many people pretend that they are okay when I ask them about the final semester. They say that everything is alright and they are not worried. I’m inclined to believe that they are not frank. It is hard to work under pressure when you have tight deadlines. It is difficult to have everything under control. Everyone needs support especially in the moments of stress. Encourage yourself and your colleagues when you spend endless days in the libraries. Drag them through the precipice of studying and let them do the same. You will finish your projects and feel the relief. Determine the priorities and know when to refuse. You need more time for the process of studying, so you should refuse from additional activities. Studying takes a long time. It is hard and difficult. You should have enough time to work on your projects and assignments, to prepare for exams and other tasks. So, free as much time as required for studying. It does not seem to stop working or stop volunteering. Just determine your priorities properly. Use the erase board to set the time for rest. Be sure that you have enough breaks. Allow yourself to spend several hours walking in the park or meeting friends. You need it! 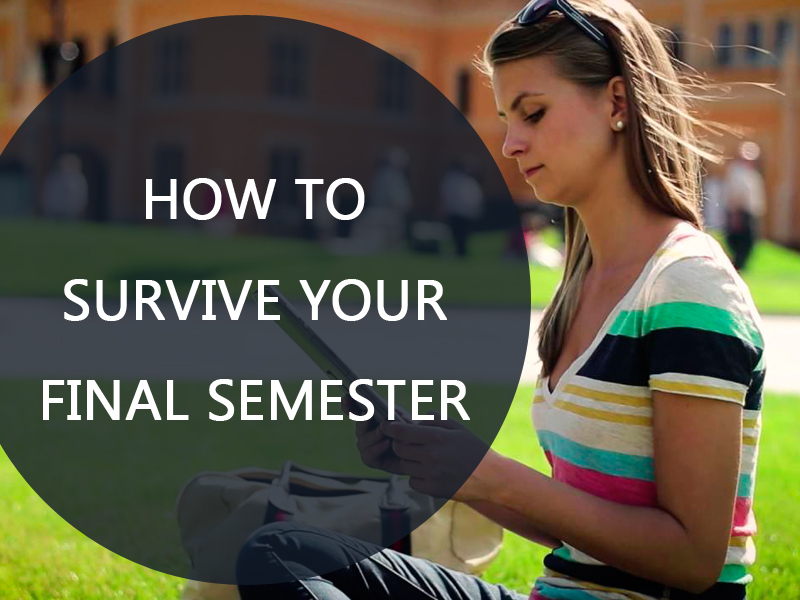 Rules above should help you survive in the final semester. Do not forget about your colleges. They need these pieces of advice too. Share with them and spend not only your study hours together but also the leisure time. Try to rest more. Remember: the more you rest now, the more productive you will be then.